Good morning ... Vitals is coming to you a little late this morning because of an embargo on the big news of the day. Hope you don't mind. The Trump administration this morning will finalize new rules for "short-term" insurance plans — one of its most significant steps yet to chip away at the Affordable Care Act's insurance markets. The big picture: Short-term plans are cheap, and offer few benefits. They appeal mainly to healthy people, and that's why the Obama administration limited the plans — to keep healthy people in the ACA's exchanges. The Trump administration is moving hard in the other direction. 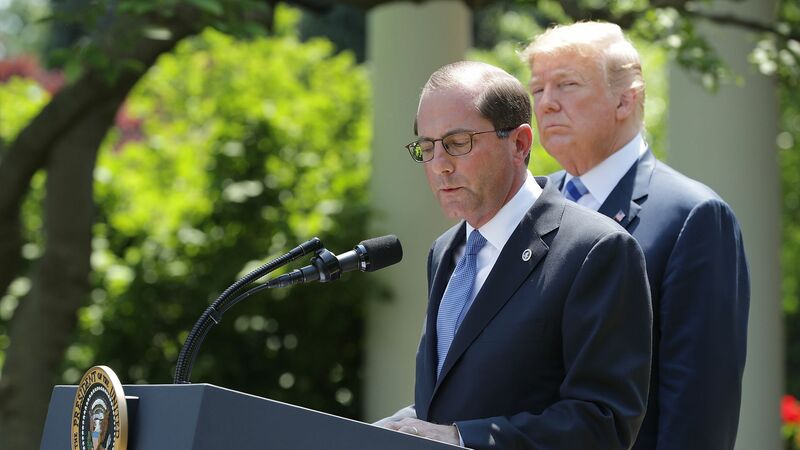 How it works: The new regulations will allow a "short-term" plan to last up to a year, and consumers will be able to renew them for a maximum of two more years, senior Health and Human Services officials said. The Obama administration, by contrast, only allowed people to have these plans for three months at a time. Short-term plans don't have to meet the ACA's benefit requirements. They can deny coverage based on pre-existing conditions, don't have to cover any specific set of benefits, and can cap how much they'll pay in a year. As a result, they're cheap. “We don't expect there to be significant migration away from the exchanges," Jim Parker, an HHS senior adviser, told reporters. HHS says it's expecting roughly an additional 600,000 people to buy the policies this year, eventually ramping up to 1.6 million. It thinks only about 200,000 of those people would have otherwise used the exchanges. If that's the case, it would likely be because premium increases have driven so many healthy people out of the ACA's marketplaces already. People who don't get a subsidy to help pay their premiums are fleeing the exchanges, and people who do get a subsidy would be unlikely to give it up. Yes, but: Even if only 200,000 people leave the exchanges for these plans, this regulation isn't happening in a vacuum. It comes on top of the nullification of the individual mandate, the cuts to enrollment outreach, and the separate (less controversial) rules expanding association health plans. The bottom line: Taken together, all of these steps clearly steer healthy people away from the ACA and toward other options, all but giving up on the balanced risk pool the Obama administration had hoped to create. My colleague Bob Herman takes a look this morning at a new effort to quantify and visualize the intricate, secretive process through which drug prices are determined. The new research firm, called 46brooklyn, was founded by two former pharmacists, who decided to independently mine federal data after noticing pharmacy margins tied to Ohio's Medicaid program were dropping. Their initial research is focused on pharmacy benefit managers, the middlemen between pharmacies and insurance coverage who are under intense scrutiny from the Trump administration — and from Ohio Attorney General Mike DeWine, who has accused PBMs of bilking the state's Medicaid program. PBMs that serve Medicaid plans reap particularly large windfalls from generics, not just brand name drugs with high sticker prices, according to 46brooklyn. One of the most striking examples is imatinib mesylate, the generic version of Novartis' cancer drug Gleevec. A pharmacy would pay about $84 for a 400-milligram tablet of generic Gleevec. But Indiana's Medicaid program paid middlemen almost $300 per pill, while Washington's Medicaid agency paid only $109 per tablet. Several other states paid more than $200 per pill. Go deeper: Bob has more here. New York Gov. Andrew Cuomo is taking an unusual tack on ACA premiums: He told the state's insurance department earlier this week not to approve any rate increases tied to the nullification of the individual mandate. By the numbers: Insurers in New York's individual market have proposed an average 24% rate hike, attributing about half of that to the loss of the mandate, according to the NY Daily News. “Insurance premiums must be based on actual cost, and not political manipulations," Cuomo said. Why it matters: The loss of the individual mandate is an actual cost. Pretty much every actuary or insurance expert will tell you it's a legitimate reason for insurers to raise their premiums, at least to some degree. Cuomo is the first governor or insurance regulator I'm aware of to disagree with that conclusion. Others have rejected proposed rate hikes, but they've generally told insurers to trim overhead costs or drive a harder bargain with providers — the things they can control. Meanwhile, Blue Cross of North Carolina says it will reduce its premiums next year, by an average of 4%. The reduction would have been twice as big, the insurer said, if Congress hadn't zeroed out the individual mandate. This is the fifth election cycle since the ACA became law. And as Republicans try to build on their razor-thin Senate majority, some dreams will never die. “With 53 members we get health care done,” Sen. Thom Tillis told Politico. The other side: “Democrats are laying the groundwork to make a push for ‘Medicare for All’ legislation if they win back the House in November,” The Hill reports. Reality check: Neither of these initiatives is likely to happen before 2021 at the absolute earliest. And with the parties already so far apart and looking ahead to 2020, not much else is likely to happen until then, either. I always welcome your tips: baker@axios.com.